Cover. Top: dry seeds of the precociously germinating vip mutant (right) and its initial line cv. Torsdag (left). Bottom: seeds of the vip mutant germinate precociously in the pod shortly after contact point is reached. See Yaxley et al. pages 24-28. The current pea linkage map. 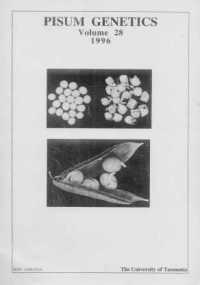 Breeding field peas for Western Australia: progress and problems. Confirmation that the sn locus is between Aldo and Gal2 in linkage group VII of pea. A more severe mutant allele at the ls locus. The problem of leaflet dentation inheritance in pea. The effect of Uni on leaf shape. A novel viviparous mutant (vip). Identification of a DNA marker closely linked to the nitrogen fixation mutant sym26 and its assignment to an unclassified linkage group. Development of an ASAP marker for bean yellow mosaic virus in Pisum sativum.